BIM Trichy’s own flash mob! Aristotle once said “the secret to humor is surprise”. On a slightly less philosophical note, let’s admit – we all love surprises (unless of course, if it involves a creepy clown leaves you traumatized for life. . . but more on that later!). Most surprises generally leave a lasting impression, a memory that stays strong and clear in a person’s mind. Surprises come in many shapes and sizes, by mail or in person. Or sometimes, it can break out in dance in front of you in a crowded place and give you your new favourite memory. I’m talking about something like the latter kind of surprise. The students of BIM Trichy organized a flash mob at Femina Shopping Mall on Williams Road, Cantonment, Trichy on the 26th of January as a way to create awareness about the BIM5kRun coming up the next week. The Sunday evening shoppers and families were treated to a music and dance extravaganza as BIM students let loose and kicked up their heels. It started off with music blaring out of a speaker and two young men breaking into dance in a small clearing. In a matter of minutes they were joined by a number of their classmates who emerged from the crowd. The fun and frolic went on for a while as a medley of popular songs filled the air and the dancers put the crowd in high spirits. Finally as it came to an end, the BIM5kRun banner was held up and the cause was disclosed – the BIM 5km run that would happen on 2nd February, 2014 from the Trichy District Court to the Union Club to build awareness on the importance of safe driving. Road accidents claim a number of lives and the saddening fact is that a major percentage of these accidents are mostly due to negligent driving. Change begins from within each and every person and it must be understood that one individual could certainly make a difference with respect to safe driving. You can also follow the happenings and news at: https://www.facebook.com/BIMMiniMarathon. Follow us at #BIM5kRun !!! And if you happen to be in Trichy at the time, you’re welcome to join us! “… I’m going to BIM..? I’m going to BIM?! I’M GOING TO BIM!! !” And that day onwards I knew my life would never be the same again. 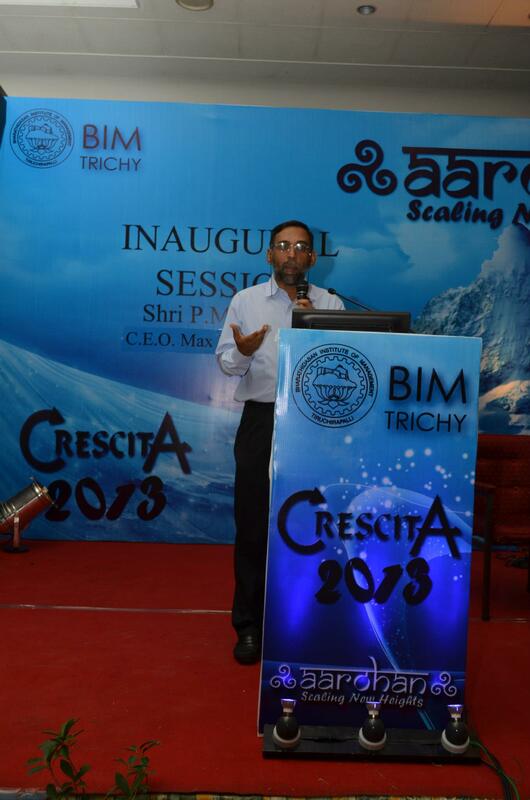 There was a sense of achievement but a growing excitement about what the immediate future held for me in Trichy. The first thing that caught my eye was the trees and the roads leading up to the college. Being as excited as I was, I caught myself imagining long walks on the endless stretch of the road leading to BIM. Little did I know what was in store for me once the programme actually began. Once the registration process was complete, I ventured to the hostel. Friendly faces and bright smiles went all around. We were calm and confident young men and women chatting away and already making plans about committees and clubs . I found people from all over India and mentally thanked whatever responsible for the handful of languages I could converse in. I found my roommates and they turned out to be great people. I was amazed to see the differences in our profiles and personalities and the ease at which we got along. After dumping my luggage in the hostel my newly found friends and I traipsed off to lunch ( a phenomenon I would later come to know as “forming” in “Stages of group formation” taught as a part of Organizational Behaviour working behind the scenes). It must be told that a crucial aspect of hostel life – at least according to me- was the food. And I am glad to say I was not disappointed. The food was delicious, hygienic and fresh, served hot – everything a home cooked meal would be like. After lunch we retired to our rooms. Learning the jargon of BIM became an immediate trend among the first years. Places like the ominous sounding “Devil’s corner” where someone had once long ago seen “something”, Wagah border – the great divide between the girls’ and boys’ hostels, the computer centre we would later fondly call “CC”, the bright green and white painted canopy and Om Shree – the kirana established solely for us were re-discovered and explored. The ice breaking session in the evening began with the professors introducing themselves and telling us stories and riddles. I remember feeling a sense of awe as each of them began to speak. Then followed a game where we had to pick up a chit at random. The chit contained the name of a brand and we were instructed to find people who had brands that belonged to the same company. We were then asked to take some time out to find out more about the people in our team and introduce them and talk about the brand they had chosen. I thought it was a brilliant game and found my partner quite quickly. Some lucky souls got really whacky brands! Then the fun began with the introductions. People were introduced and applauded for their “killer looks”, talents and weird and wonderful interests. Nicknames were born and christened. By the end of it, the purpose had been fulfilled. We all could remember something about everybody!! One person was the animal-lover and another was the brilliant cook! At the end chocolates were given out to the best introductions of the day. After a fun-filled evening, we were given the schedule for the next week. Like they say in the movies, “there’s always a catch”. And here at BIM, the catch proved to be the schedule. Class timings ranged from 8:30 a.m. to 7 p.m. – on the very next day itself. The schedule showed classes for the week and the gaps in the schedule were earmarked to be filled in later too. Though a little alarming, we drew strength from the fact that we were on our way to becoming managers and what would a packed schedule be to us. The night found us settling down, sitting on the other side of the girls’ hostel fence, chatting away and enjoying each other’s company. A new day would soon dawn. We were on our way to becoming managers – world class managers at that. All of us had the same impelling awareness – this new path would not be easy, decisions difficult to make. But we knew we were in safe hands and that the journey had only just begun. 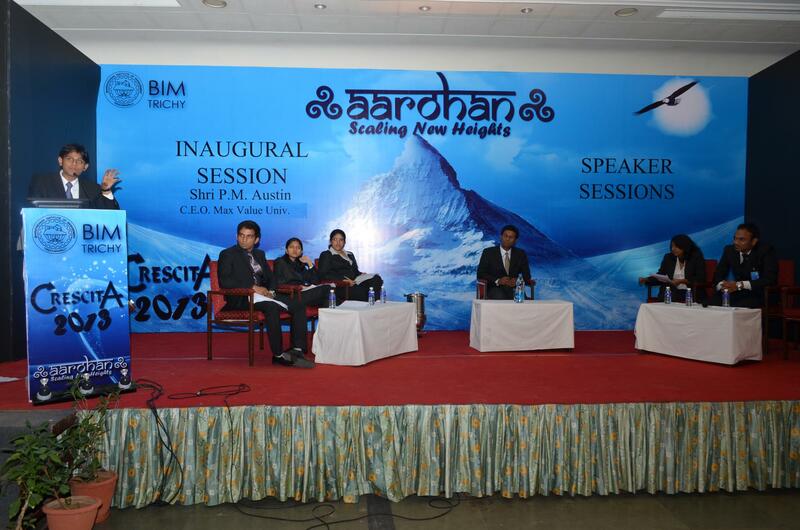 The Grail – Business Plan Event at Aarohan : Crescita – 2013. The B-plan witnessed myriad opportunities projected by students of reputed business schools. Every single entrepreneurial idea was unique in its own way and it was followed by a very constructive question & answer session that analysed not only the plan put forth by the students but extended over and beyond to encapsulate the entire industry in question. In short, the entire contest was a platform to encourage budding entrepreneurs and was a huge exposure to the realities of industry. Role of Marketing in Tiding over the Economic Crises by Mr. Vikas Gupta , Founder & Director, 9.9 Mediaworx Pvt Ltd.
Mr. Vikas Gupta, Founder & Director, 9.9 Mediaworx Pvt. Ltd. addressed the gathering on the Role of Marketing in Tiding over Economic Crisis. The speech illuminated on the Shades of grey in marketing and how that interpretation is what that makes the difference in the corporate scenario. He dispelled the myth quite convincingly that Marketing is not just glitzy glamour!! He simplified that its just as simple as “Pursuit of “HAPPY”ness”. A happiness cycle that brightens the lives of customers, corporate, employees and stakeholders. Mr. Vikas also expounded the importance of circulation of money to sustain the economy. Mr. Vikas Gupta’s All time Saviour Tips were all about marketing features, and not price; the significance of consumption mapping while planning media strategies and the overwhelming power of internet. Also, the impact an innovation can have, was illustrated with examples. The very fact that Marketing has no black and white logic, and it’s all about painting it with your own hues of sparks of creativity was also explained. To conclude, Mr. Vikas spoke on the very essence of marketing and its contribution to stimulate demand. This was followed by an intense question and answer session and it was a huge exposure to the students to get Gyan from a stalwart in the Marketing Industry. The concluding event of the day “Customer Loyalty- A reality or myth?” was a more than just a debate between the two batches of BIM. It was a war of ideas and thoughts which brought about an interesting perspective on the topic. From PGP-1, advocating that Customer Loyalty is still alive today, Shyam Prasad, Bharathi Swetha and Captain. Jyotsna Venkatramanan put across points that conveyed its not the money, but the value that a customer sees in a brand that makes him “loyal”. From PGP 2- Battling on the other side were Jyotsana Menon, Shiva Aditya and Utsav (Captain of PGP-2) who fought it hard to prove that “Loyalty” and “Consumers” can never go hand in hand. Judah Jebadas who was the moderator managed to keep the audience glued on with his witty comments. 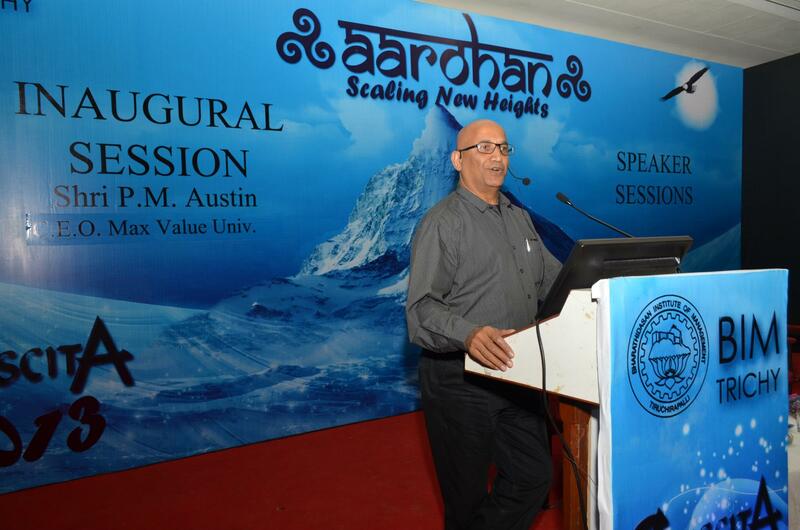 The first day of Aarohan saw a lot of inspiring thoughts and perspectives on issues that seemed impossible to face. What started off on a positive note with “BIG Ideas” seemed to gain momentum throughout the day. The day ended only in terms of the sessions, but was a new beginning for every member present in terms of their outlook for the challenging future that lies ahead. 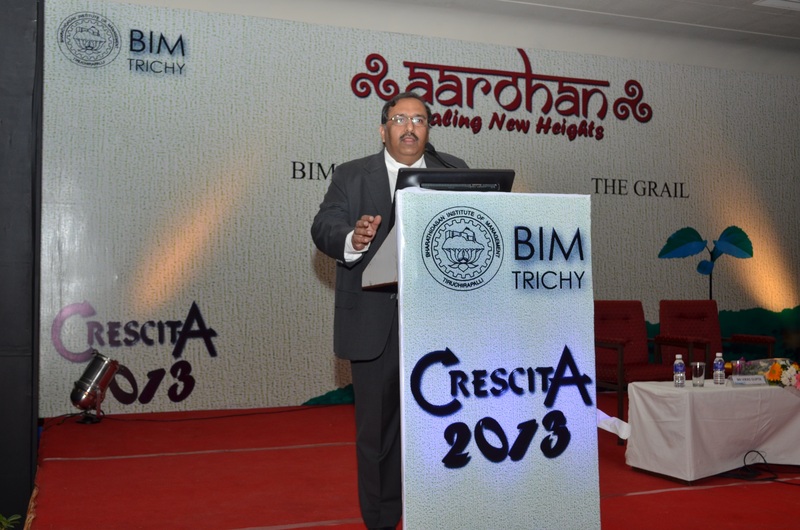 Economic stability and social stability is interlinked, highlighted Mr. Raghunathan, the next speaker for Crescita. In a series of lectures which have focussed over various facets of management Mr. Raghunathan presented his perspectives on the most core area of management, Finance. With vast experience in the financial field and with CDSL he gave an in depth perspective both on the contemporary and issues to be expected in future in the financial domain. He began his presentation with explanation on the basic financial concepts like relevance of securities market, market specifics, and key concepts on how wealth can be created. He also touched upon the on what a corporation expects both in the financial and non-financial terms, what regulators are and how important in the current financial environment their roles are. Along with simplifying the basic concepts of the financial domain, Mr. Raghunathan, articulated the pressing issues which are projected in the next decade. He mentioned that the most important aspect which has to be imbibed is the corporate governance which will lead to rise of better, trustworthy and progressive corporate institutions. He concluded the session by his caveat that in the financial world volatility will always be pronounced so to avoid the risks in this highly volatile market one must always combine risks which will provide the investors a suitable buffer. Finally he closed off stating that like life, financial world is too uncertain and hence judicious and reasonable measures must be taken to ensure that either in bull or bad cycle we are safe and prepared enough to see off any phase.